This 25 year old Canadian beauty has a well deserved huge Instagram following (@valerie.c_) and it isn’t hard to see why. 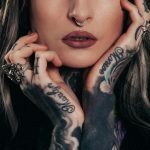 If you’re an ink lover then you may have just found your perfect woman. Valerie Cossette is the perfect blend of bad and beautiful. Valerie Cossette first started uploading photos to Instagram in 2014 which shows how quickly her following has built. Valerie Cossette is also an ambassador for men’s and women’s watch company Philipp Auger that she promotes on her Instagram page.